It’s Sunday (again) and time for part two of my 2015 patisserie challenge. This year I have decided to buy something different from our village boulangerie every Sunday and to enjoy the simple pleasure of treating myself each week. Last week I sampled and shared the buchette de noel. To begin with I have decided to stick with the familiar and revisit some of Ed’s favourite patisseries, as he is far more the connoisseur than I am. 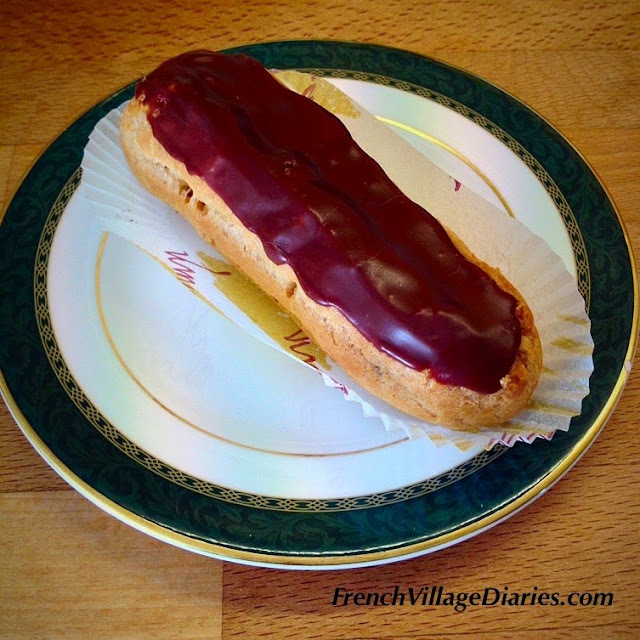 My choice this week is the éclair au chocolat or chocolate éclair, although there is a big difference between the two. The chocolate éclair made in the UK is a choux pastry case filled with whipped cream and topped with chocolate. The French éclair au chocolat is filled with a chocolate crème patissiere (confectioners custard). Just one bite of this gooey, chocolaty delight and I was firmly in the French camp when it comes to the filling. It is a little sweet, but accompanied with a strong espresso coffee it is just perfect and in my opinion, not as rich as the whipped cream version from across the channel. I can certainly see why Ed would ask for one of these as often as possible when he was younger. Although it was a cold and frosty start to the day, the sun is now shining and I think a bike ride will be the perfect way to ensure these extra patisserie calories don't stick around for too long. Please do come back next Sunday and join me as I tuck into another delight from Bernadette at the village boulangerie.